4 Students Receive State Recognition from Duke TIP! Each year, Duke TIP identifies a group of academically talented students in the United States based on their exceptional grade-level standardized test scores. Only those who score at or above the 95th percentile qualify. Those students are invited to participate in the 7th Grade Talent Search and to take the ACT or SAT, which are designed for college-bound eleventh and twelfth graders. Taking an above-grade-level test is an experience that allows these gifted seventh graders to more accurately gauge their academic abilities and potential, as they need more advanced examinations than they find in their grade level. Vincent B. Isa C. Moorea E. Dylan G. Ethan H. Blake H. Hayden K. Andrew L.
Brady M. Owen M. Allie N. Luca O. Jacob S.
The following honorees have earned State Recognition an award by scoring approximately at or above the national average of recent high school graduates on at least one part of the ACT or the SAT. 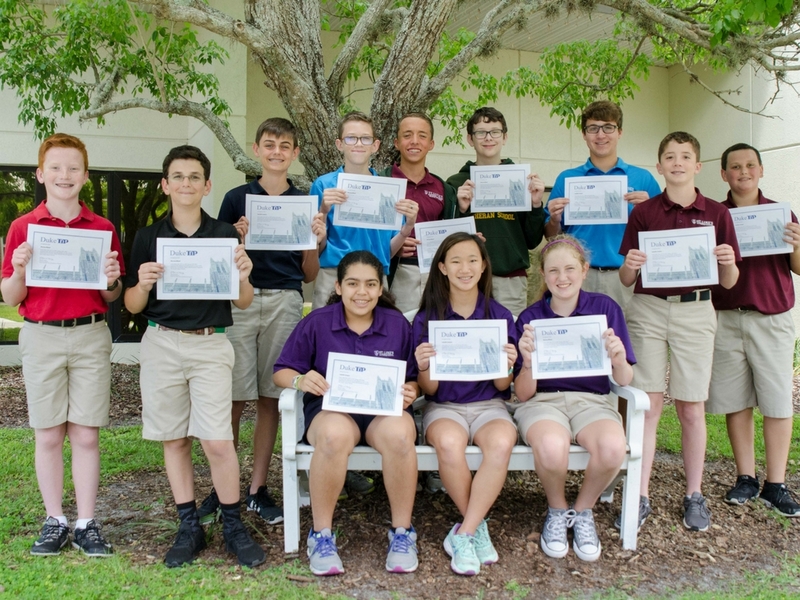 These students are invited to a special recognition ceremony held at St. Leo’s University on May 18. Congratulations goes to the following students.